U.S. tax rules contain a mathematical formula to determine tax residency. This formula involves counting the number of days that you are physically present in the U.S. over a three-year period. This residency formula is called the Substantial Presence Test (SPT). Based on the SPT formula, if you exceed 182 days, you are deemed to be a resident of the U.S. for income tax purposes. With respect to 2016, the SPT formula takes all of the days in the current year (2016), 1/3 of the days in the previous year (2015), and 1/6 of the days in the second previous year (2014). You total the results from this formula, and if you were in the U.S. for at least 31 days in 2016, and at least 183 days based on the three-year formula, then you are deemed to be a U.S. resident in 2016 for U.S. income tax purposes. If you meet the SPT but you were in the U.S. for less than 183 days in 2016, you may file a form with the Internal Revenue Service (IRS) to report that you have a closer connection to Canada and are thus exempt from the U.S. residency designation. This form must be submitted to the IRS by June 15 of the year following the tax year in question (June 15, 2017 for 2016). We can help you determine if you need to complete this form for 2016 if you provide us with the number of days that you were present in the U.S. in 2016, 2015 and 2014. 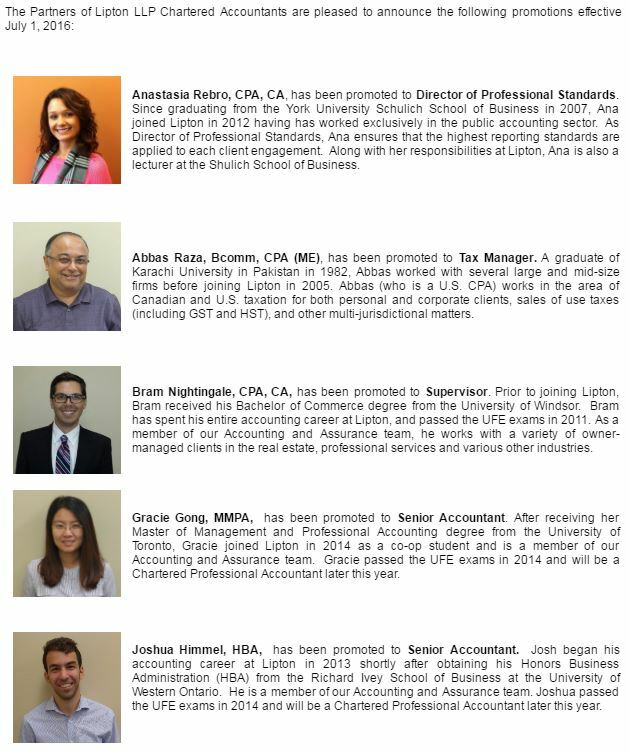 Please contact your Lipton adviser if you have any questions in connection with this or any other matter. On April 27, 2017, Finance Minister Charles Sousa tabled his fifth Budget. The deficit for the 2016-17 fiscal year is projected to be $1.5 billion, with a balanced budget projected for 2017-18, 2018-19 and 2019-20. The Budget does not include any changes to Ontario’s personal or corporate income tax rates. Please Click Here to read Lipton’s full Ontario Budget Commentary. This publication has been carefully prepared, but it has been written in general terms and should be seen as broad guidance only. The publication cannot be relied upon to cover specific situations and you should not act, or refrain from acting, upon the information contained therein without obtaining specific professional advice. Please contact Lipton LLP to discuss these matters in the context of your particular circumstances. Lipton LLP, its partners, employees and agents do not accept or assume any liability or duty of care for any loss arising from any action taken or not taken by anyone in reliance on the information in this publication or for any decision based on it. When the new government said last year that it would return Canada to deficits, few expected the numbers to jump to nearly $30 billion this year and next and add $100 billion in debt over the next five years. But lower than expected revenues have forced the government’s hand, according to Finance Minister Bill Morneau, requiring increased spending to stimulate the sluggish economy and support the middle class. Despite failing to make good on “key election promises relating to fiscal management,” there are enough positive indicators in the budget that CPA Canada is taking a wait-and-see approach, calling it a “down payment on a long-term fiscal plan that charts a course to strengthen the Canadian economy.” Among the positive signs are efforts to close tax loopholes, reduce tax evasion and increase tax compliance. Fulfill the Harper Government’s promise to balance the budget in 2015. The Government will return to balanced budgets while maintaining the lowest federal tax burden on Canadians in over half a century. Support jobs and growth by making Canada more competitive and allowing job-creating businesses to thrive; making new and innovative investments that build on the Government’s historic support for infrastructure; and training a highly skilled workforce that responds to the evolving needs of employers. Help families and communities prosper by continuing to provide tax relief and other support for hard-working families and individuals while enhancing opportunity for all. Ensure the security of Canadians by supporting the Canadian Armed Forces and protecting Canadians from the threat of terrorism at home and abroad. 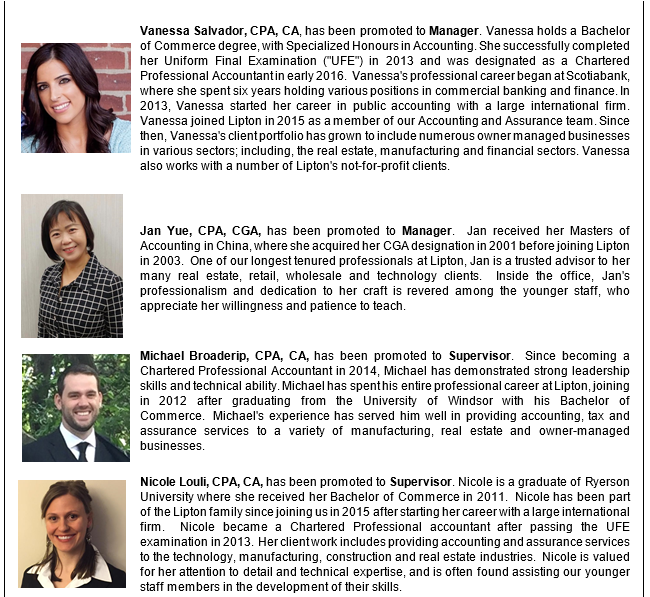 Jeff Nightingale is the Co-Managing Partner and Senior Tax Partner at Lipton LLP, Chartered Accountants. Jeff has written a number of publications and speaks to a variety of professional and business groups, including the Canadian Tax Foundation, the Institute of Chartered Accountants of Ontario and The Law Scociety of Upper Canada. 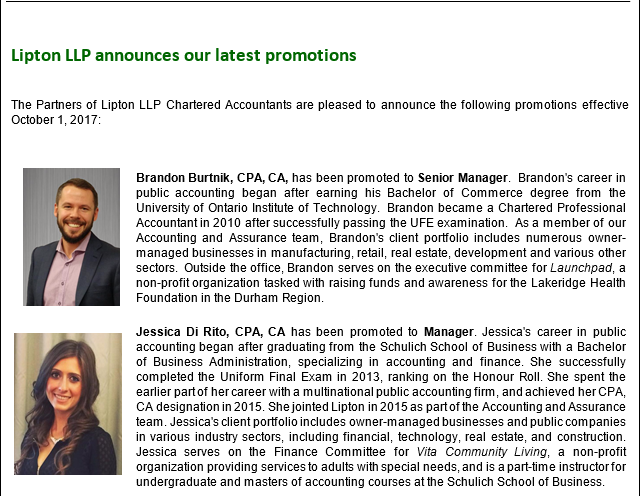 He has also completed the CICA In-Depth Tax Course as well as other advanced taxation courses and is a member of the Canadian Tax Foundation and the Society of Trust and Estate Practitioners. Managing Partners Fred Arshoff and Jeff Nightingale discuss the importance of corporate retreats, and how they can help your business. Have you headed south of the border for the winter? If you are a Canadian resident who pays Canadian taxes and spends a considerable amount of time in the US, then make sure you understand the various tax issues that can occur once you cross the US border. 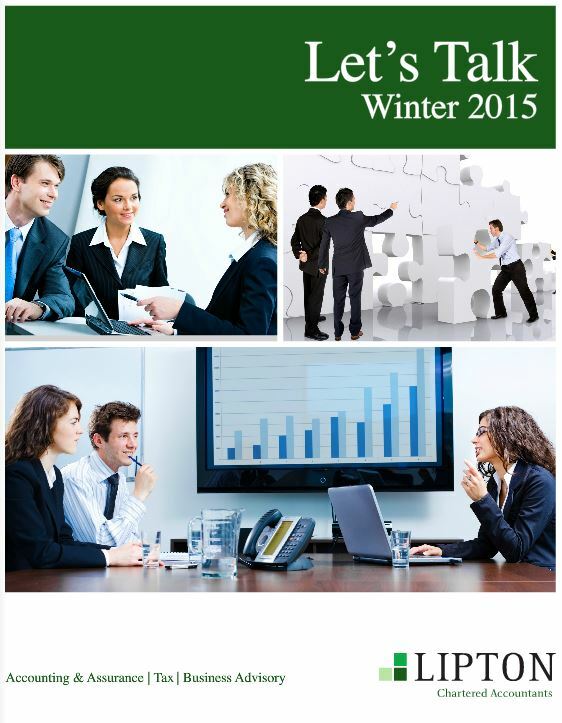 Commencing in 2015, things will be a little different for the clients, partners and staff at Lipton. Steve Altbaum, the only remaining founding partner of the firm, retired on December 31, 2014 after 43 years of providing service and advice to his clients. But things won’t be entirely different. Steve will still be there when his clients and the people at the firm need him. The world has changed dramatically since caveat emptor, Latin for “Let the Buyer Beware,” was first spoken. Unfortunately, the principle still applies today, even in an online marketplace. While ecommerce has become viable and even mainstream for many companies, it still holds potential risks for individual consumers and businesses. We are currently experiencing issues with our Terminal Server and Mobile Email Support. As of right now, we are unable to receive and send emails via our mobile devices, however the email in the office is working fine. We are still recieiving in the office and we can send from the office without issue. The address that we use to access the Terminal Server is also down, however, we have configured a working solution, allowing you to get onto the Terminal Server and work without issue, as well, allowing you to check your mail. 1. 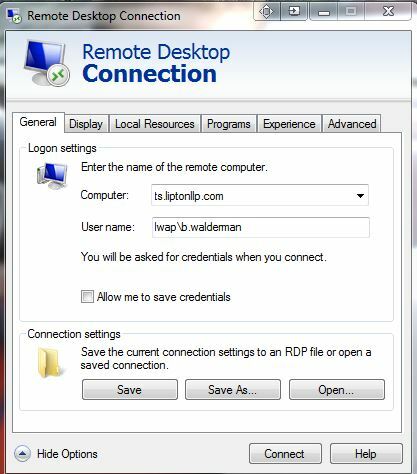 Launch the Remote Desktop Connection program from your start menu, or click on the existing icon you use to access the Terminal Server. Your username is typically, first inital.lastname, for eaxample, my username is b.walderman. 5. Once complete, click SAVE and CONNECT. This will prompt you for your password, which is the same password you use to log into the network. 6. You should now be connected to the Terminal Server. We are working to get everything back to normal, your patience is truly appreciated. The Federal Government presented its 2014 Budget, “The Road to Balance: Creating Jobs and Opportunities,” on Tuesday, February 11. The Budget includes in its 419 pages approximately $280 billion in spending over the next several years. The Government won’t raise personal or corporate taxes in 2014 and predicts a $2.9 billion deficit in 2014-15, leading to a surplus of $6.4 billion the following year and $10.3 billion by 2018-19. The final deficit for 2013-14 was $16.6 billion, less than the $17.9 billion estimated in the fall. The Budget offers no grand statements, but many targeted measures aimed at increasing revenue, preventing tax evasion, reducing the cost of Government, fostering innovation and supporting job creation through infrastructure spending and incentives for business. CPA Canada approves of the Government’s measured efforts to reduce the deficit and balance the country’s books. Gabe Hayos, CPA Canada’s vice-president of taxation, advises that “Spending shouldn’t pick up until it is clear that the budget is balanced and additional money is available.” However, the Government did not propose any significant measures to make the tax system more efficient and reduce the red tape that businesses face. Nonetheless, the CPA Canada gives the 2014 Budget a “silver medal” for its efforts in this Olympic year, with the hope that the Government will implement comprehensive tax reform when Canada returns to a surplus position. And there is hope. The Budget commits the Canada Revenue Agency to holding nation-wide consultations every two years to gather ideas on improving services and reducing bureaucracy for small businesses. The Canadian Federation of Independent Business was a stricter judge, giving the Budget a bronze. The Budget may not thrill Canada’s business community-and some will likely not notice much change at all this year-but many organizations will enjoy benefits. On the other hand, some businesses and non-profits will want to take a look at their governance and accounting practices in order to keep the tax man from knocking on their doors.